Back in print and available from D.A.P. 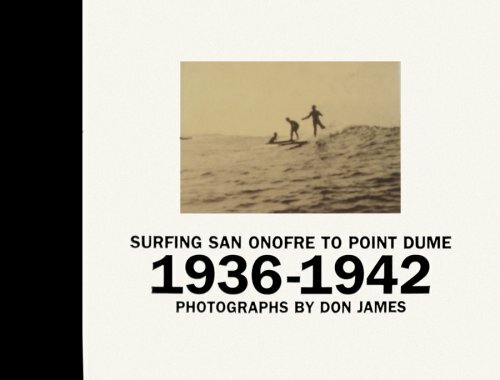 for the first time, this beloved best-seller tells the story of the heady and innocent years of Santa Monica’s nascent surf scene just prior to America’s entry into World War II. Beautifully designed, this intimate, album-sized collection of photographs, printed in rich duotones and evocative color, captures the optimism and experimentation, the styles, the flirtatiousness and the freedoms taken—all from an insider’s point of view. They were made by the young Don James, a teenager who documented the scene with his father’s old Kodak folding camera when he wasn’t up on a longboard himself. Out in the surf, down on the sand, aboard somebody’s boat, dancing around a campfire, back-flipping off the lifeguard stand, collecting lobster, drinking at the bar and generally wearing as little as possible, here are the regulars of the southern California beach scene, unself-conscious and perpetually glamorous, alongside loving portraits of the beach and the ocean themselves.